Nice work, MD. 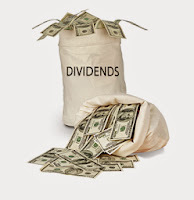 Congrats on the dividend income. You have a nice amount of passive income and your total that you have brought in is good keep it up. Congrats on going over $20K of total dividend income! That's a huge achievement :) Bravo Monsieur D! Merci Div in Hands. ;-) It's a great sum and it wasn't so hard to achieve in the end. That is the power of investing! Not a bad month at all. Instead of selling to keep your asset allocation in line - do you ever consider just moving additional contributions towards the asset class that's below your target? Hey timeinthemarketblog ! absolutely. If my bond allocation goes up and my stocks allocation goes down I can take some fresh money and buy more stocks -- instead of selling bonds. I try to buy stocks when Mr. Market is down and buy bonds when Mr Market is up. Awesome month of dividend income - really like RBC as a company and hope to pick up some shares in the future - price willing. Im including your monthly income report in my monthly round up.